Grey seals are one of the rarest seal species in the world and about two thirds of the entire population lives in British and Irish waters. Grey seals are one of the rarest seal species in the world and about two thirds of the entire population lives in British and Irish waters. They have a distinctive horse-like face with a long muzzle, large appealing eyes and long whiskers. Their streamlined body and flippers enable them to move easily through the water. Their fur is not a uniform grey colour, but can vary from light to dark speckled grey and even black. 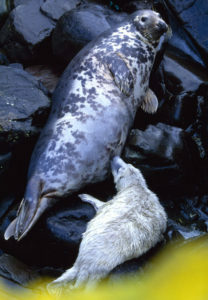 Grey seals usually come ashore to breed from late September until November. They prefer barren uninhabited islands and often go back to the same beach each year to breed. They give birth to a single pup and the mother sniffs it repeatedly to get used to its scent. The pups have pure white fur and cannot swim until they have moulted this fur a few weeks later. The pup suckles the very rich milk from its mother every five hours for three weeks and grows rapidly putting on 1.2 – 2 kg per day. These amazing creatures can be seen around the coast of the UK. 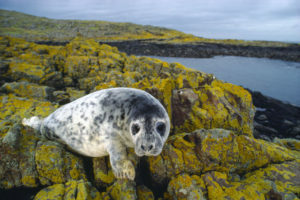 Grey seals are particularly abundant around the coasts of the Outer Hebrides and the Orkney Islands in Scotland. Small numbers are found off the coasts of Norfolk and Lincolnshire and larger numbers off the Farne Islands, Isle of May and the Shetland Islands. They are increasing in number partly because hunting pressures have eased.